My name is Jerry Berger, and I have been teaching elementary general music class in a public school for the last twenty years. It wasn’t until about eight years ago that my wife and I decided to follow the leading of the Lord and home-school our children. As you can imagine, being a homeschool parent and working in the public school arena has not been without its challenges. I work with many wonderful and gifted educators, and am very grateful to have a job that allows me to provide for my family. Would I rather be at home helping educate my own kids? Absolutely! However, until that becomes a reality, what I can do is share with my wife technology ideas that I find useful in my classroom, and that other teachers use to supplement their own teaching. My focus for this article will be to share a few of the music games and apps that I use in my classroom, and how they might be beneficial for homeschool as well. I have these and others listed on my blog at www.westgatemusic160.blogspot.com. For example, if you’re doing a unit on instruments of the orchestra, check out the interactive Benjamin Britten’s Young Person’s Guide to the Orchestra game on the Carnegie Hall website. They also feature a Music Educator’s toolbox page for ideas and lesson plans that cover all of the basic concepts of music. Need help with note reading on the treble or bass clef? Try the Staff Wars game at themusicinteractive.com! It’s free, has a performance feature for playing an instrument such as soprano recorder or piano, and is available for apple and windows applications. Staff Wars also available as an iOS app. There are also other games on this site that cover rhythm and melody, such as Krank & Lucy, Jama Mambo, and Rhythm Blocks. Speaking of soprano recorder, I begin teaching this melodious instrument to third grade aged students to reinforce note reading and ear-training skills. This year, I found a great tool called Alfred Recorder Express Interactive Interactive ; a CD-ROM that teaches recorder technique, note reading, and rhythm in a fun and engaging way. Music is a wonderful subject and a critical part of the education experience. It is also a critical part of the human experience. 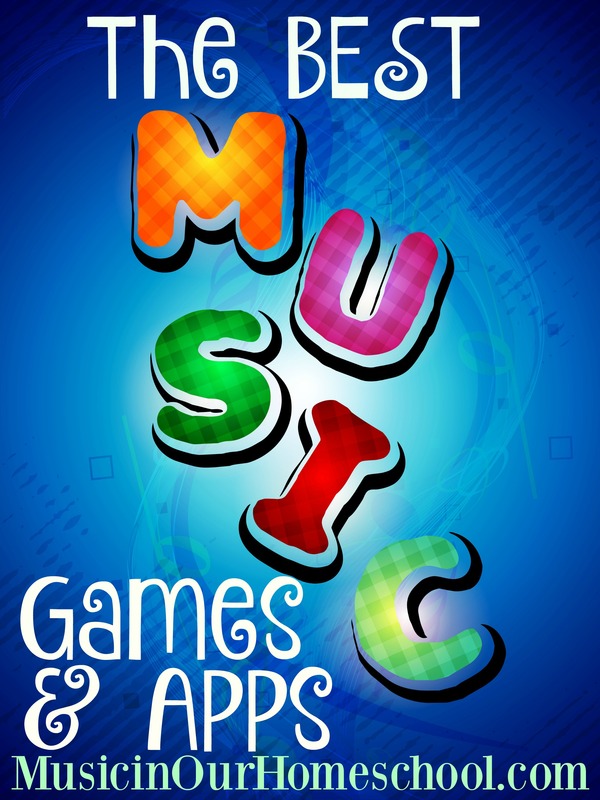 Hopefully, the music games and apps ideas listed above will be of use as you share the gift of music with your children. *Today’s post is Part 1 of the BEST Music Games and Apps series. Be sure to follow Music in Our Homeschool through email and on social media so you’ll know when the other posts are up! About Jerry Berger: Jerry is a homeschool dad of 3 and public school music teacher of 20 years. He also participates on the worship team at his church and performs in musical theater. You can read more about his favorite music resources his blog www.westgatemusic160.blogspot.com. Thanks for this, we always love learning about the apps that people find useful. Hadn’t tried out staff wars so will look at it. We love apps that link with composers as well – have you seen the Little Tchaikovsky App? We wrote about it in a post on music for 4th of July http://raisingcreativechildren.net/july4th-music/ Look forward to your other music app posts!